We reported back in May that director Adam Wingard is coming aboard to direct the highly-anticipated Godzilla vs. Kong, which brings both the Godzilla and King Kong franchises together. Since we still have just under three years left until this hits theaters, no specific details have been given, but our own Julian Roman spoke with Adam Wingard while promoting the director's new Netflix movie Death Note, arriving August 25. Wingard clarified some details about this epic showdown. For one, he confirmed that this movie is in fact a sequel to Godzilla 2, which is currently in production and set for release on March 22, 2019. And it will be the follow-up to this year's Kong: Skull Island. Here's what the director had to say below. "Technically it is a sequel to Godzilla and Kong. There is Godzilla 2, which they are filming right now. We have some of the cast that is from that one. This will probably be the most direct sequel to that movie. They are stacking them up. Its very exciting. We're still in the early phases of it." With Godzilla Vs. Kong a direct sequel to Godzilla 2, we can expect it to take place in our current day timeline. So it won't be a period piece like Skull Island, which means those characters aren't probably returning. While the director wouldn't clarify which characters from Godzilla 2 will be featured in his movie, the cast for that next sequel does include Millie Bobby Brown, Kyle Chandler, Vera Farmiga, O'Shea Jackson Jr., Aisha Hinds, Charles Dance, Thomas Middleditch, Bradley Whitford, and, from the 2014 Godzilla movie, Ken Watanabe as Dr. Ishiro Serizawa and Sally Hawkins as Vivienne Graham. 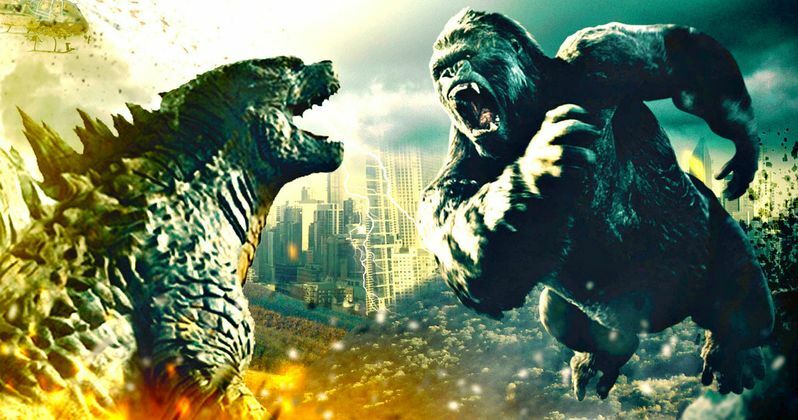 Still, Warner Bros. hasn't confirmed any cast members for Godzilla vs. Kong yet, but Adam Wingard also added that while there are characters who will be reprising their roles in Godzilla vs. Kong, there will be plenty of new characters introduced as well. "There are characters that are carrying over. We're still in such an early phase with it that we're still kind of in the writing phase. There are definitely a lot of new characters in our film that aren't in Godzilla 2. It's still early." The script will come from the Godzilla and King Kong writers room, which includes scribes such as Lindsey Beer (Barbie), Patrick McKay & John D. Payne (Star Trek 4), T.S. Nowlin (The Maze Runner), Jack Paglen (Alien: Covenant), Terry Rossio (Pirates of the Caribbean), J. Michael Straczynski (Thor) and Cat Vasko (Queen of the Air). It hasn't been confirmed which of these writers will specifically be working on the Godzilla Vs Kong script. Still, there is plenty of time for these writers to hammer out a story that will make fans of both franchise proud. Warner Bros.' 2014 Godzilla reboot was a smash hit for the studio, taking in $200.6 million domestic and $529 million worldwide, from a $160 million budget. The studio then brought King Kong back to the big screen this year with Kong: Skull Island, featuring an all-star cast featuring Brie Larson, Tom Hiddleston, John Goodman, Samuel L. Jackson and more. While the domestic total came in just a bit lower than Godzilla, with $168 million, it did perform well overseas with $398 million, for a worldwide total of $566.6 million, from a $185 million budget. Take a look at our video interview with Adam Wingard to learn more about Godzilla vs. Kong.